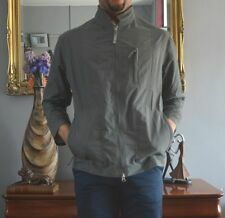 New listingArmani Jeans Bomber Jacket RRP £200 Emporio Armani/Giorgio Armani size S 48..
ARMANI JEANS LIGHTWEIGHT BOMBER JACKET. WITH HIDDEN HOOD. SIZE 48 SMALL. 100% AUTHENTIC/GENUINE. Collection: Armani Jeans by Giorgio Armani. Smart jacket by Armani from the Armani Jeans collection. Dark olive green. Shell: Nylon. Pit to pit: 23 in / 58.5 cm. The sleeves have been altered to make them shorter. (Colour: Due to the quality differentation between different monitors the picture may not reflect actual colour of item. In very good used condition! B) Sleeve from pit. Made from 100% Nylon. If you are in doubt about fitting, just comparable size to those of similar your clothes. This is the safest way. 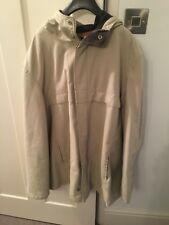 The lining slightly bobbled, otherwise the jacket is i n very good used condition ! Constructed with long sleeves and a central zip closure, this casual piece features a detachable faux shearling pointed collar. Boasting a multitude of pockets and elasticated ribbed cuffs. SIZE 52(Large). Model: 7V6B16. Warm hooded bomber jacket by Armani from the Armani Jeans collection. Collection: Armani Jeans by Giorgio Armani. Padding: real duck down. Removable hood. 2 pockets with zip and flap fastenings. Type: Harrington Jacket. Material: Nylon. Label Size: IT 50 Large. Colour: Black. Chest Size: 50. Model: 7V6B05. Warm hooded bomber jacket by Armani from the Armani Jeans collection. Collection: Armani Jeans by Giorgio Armani. Fixed hood. Lightweight nylon shell. Lining: nylon. Machine washable. Regular fit. 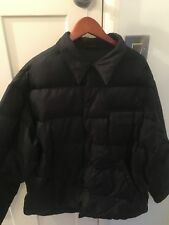 EMPORIO ARMANI JACKET. 55% COTTON & 45% NYLON SO WILL KEEP YOU DRY. HIGH STANCE NECKLINE WITH HOOD IN ZIPPED COLLAR. CLEAN & READY TO BE WORN. FULL LENGTH FROM THE TOP OF THE COLLAR TO THE BOTTOM OF THE HEM IS 30.5". Style: puffer. Type: Jacket. Top quality clothes. Why BeOriginals?. Polo shirts. Technical Clothing. | Size from label: M. 4/6 - good condition. 5/6 - very good condition - normal, little signs of used. 5 /6 - near perfect condition - barely visible signs of used. THIS IS A GENUINE ARMANI ITEM BOUGHT AT A DESIGNER OUTLET. THE ITEM IS CODED V6K33XM-11 RN# 103723. ALL ARMANI LABELS ARE CLEAR TO SEE. ARMANI LOGO PULL CORD ON THE ZIP. ARMANI LOGO-ED BADGE ON THE HEMLINE. Sizes: Label size: I 52 / US 36 / GB 42 / F 44. Length approx. : 25".